Avoid any kind of errors on the application – Cross-outs, white-out, or any other marks on the application are strictly forbidden. It’s better to pay close attention while filling out the form and use black ink only. Filling the form online and printing is suggested. Birth Certificate – Must be an original or certified copy of your birth certificate. It should be the state issued long form with parents full names (hospital certificates and photocopies are not allowed). 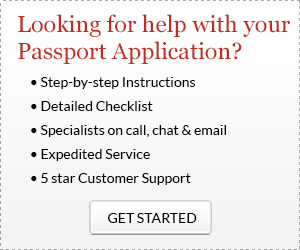 Passport Photos – Common errors with photos include applicants trying to take the pictures themselves instead of having it done at a professional passport camera outlet such as CVS, Walgreens, Kinko’s. Expired film, bad quality images, wrong color background or image of head too large or too small are major reasons for denials. Click here for some examples of Passport Photos. Applying on Behalf of a Minor – both parents including the child must be present. In the event that the parent or guardian cannot both be present, proper consent forms must notarized.